Set on a desert highway in the heat of the day, Ni Ni is looking for a ride. She holds pieces of corrugated cardboard with her destinations written on them: "OUTTA HERE" and "SOMEWHERE". Cars and lorries drive past as our Gucci hitchhiker tries to thumb a lift. 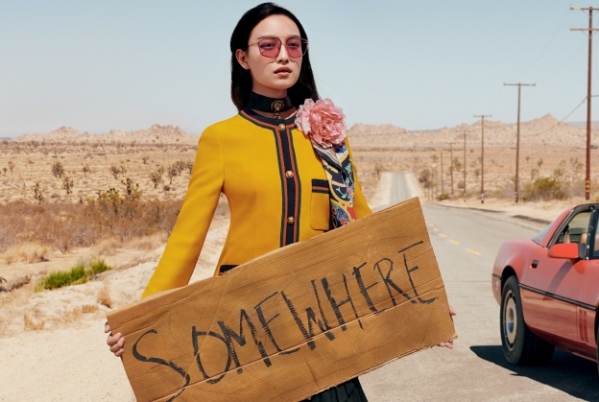 Inspired by cinematic imagery and shot by photographer Hugo Scott and art directed by Christopher Simmonds, the campaign is colourful and whimsical; the actress, dressed in Gucci and wearing Gucci eyewear, cuts a distinctive figure, a character in an imaginary road movie. In one image, Ni Ni wears an eye-catching sunglasses style featuring an ultra-light, shiny gold-toned metal frame with a parabolic lens shape; the lens is in a solid cherry colour. The bridge over the nose forms part of a continuous sweeping curve, and Gucci lettering marks the slim temples; there is an interlocking G detail on the cut-out end-tips of the arms. In another shot, Ni Ni sports a timeless rectangular optical frame, which presents a front metal rim and slim temples, all in shiny in gold colour. As with the other style, the temples are adorned with Gucci lettering and the Double G motif appears on the cut-out end-tips of the arms. The campaign launches in February.